I am headed up to Harvard this evening to attend the Privacy Symposium. I am very much looking forward to this industrial-strength dose of privacy discussions. This will also be a bit different for me as the majority of speakers are lawyers. Usually, I sit in conferences listening to techies and the occasional auditor. The Privacy Symposium speaker list is lawyer and professor heavy with a few representations from the tech world. It ought to be a nice change. The subtitle of this Privacy Symposium is “Privacy in Transition.” Well timed. I look around my neighborhood and my city and I can practically see those transitions in real time. I’ve talked about the security cameras in my neighborhood before. This weekend, the Washington Post reports that DC is planning on sing license plate readers to “fight terrorism.” Find stolen cars – sure. Find Osama bin laden – not so much. The District has got to release data retention plans for this data quickly. For now, the word is that this data will not be retained. The systems checks plates against “Federal databases” and looks for matches. (How long until we have a No-Fly list equivalent of license plates?) I have to imagine that the data retention policy will change very quickly. How long until third parties get access to this data? I can see the District using the revenue it makes from selling access to this data to divorce lawyers to pay for school repairs. At any rate, I’ll be in Cambridge this week mulling some of these ideas over hearing more on matters like these. See you there. After Shamshu (or Uncle as he is known in the office) picked me up at oh-dark-thirty, we headed to the office. There in watching everyone try and get organized, I introduced him to the expression “herding cats.” I knew I was in for a good time when I noticed dried vomit festooned on the side of the bus. Shortly after, Shamshu asked, with a slight malevolent grin, “Do you get the motion sickness?” I do, Shamshu, I do indeed, but I had prepared for such a situation by doping up appropriately. So off we went, about 2 hours later than we were supposed to. And by off we went I mean to say, we started fighting through traffic in Pune. Both buses stopped a while later to pick up more people. (There were two buses. Hare Krishna, seen above, and The Short Bus, which will be taking a prominent role in a moment.) In the crew that we picked up at the second included Shishir, Kaustubh, and Aniruddha. After much back and forth, it was decided that the drinkers and smokers would take The Short Bus and everyone else would ride with Krishna. So off we went… again. Queue Bollywood sound track at earsplitting decibels. After an hour of that I did make out the distinct sound of a beer being opened. Okay, I’m thinking, this is a good old fashion road trip. Kingfisher in hand I sat back and enjoyed the drive out of Pune and into the hills. Stopping at a Tata Power Generation control reservoir I got a good sense of the landscape reminded me of Southern California. On the way back to the bus I saw something hanging from the open engine compartment. Shamshu called it lemon chili and it was, supposedly, for good luck. Keep that good luck charm in mind. I love McSweeney’s, both the quarterly collection of literature as well their other publications and books. Besides the care and crafting of the content, the quarterly collections have really interesting artwork and packaging. I just got issue 28 and this one takes the cake from the packaging perspective. And then I thought, “why is it that only Apple products get unboxing photos?” So, for your pleasure, I present to you the McSweeney’s Issue 28 unboxing. You’ll note that each little book is one story. Someone paid for this ad campaign? I saw the attached poster today in Union Station. I stood and stared at it wondering whether I read it correctly. Then I took a picture of it and stared at that for a while. 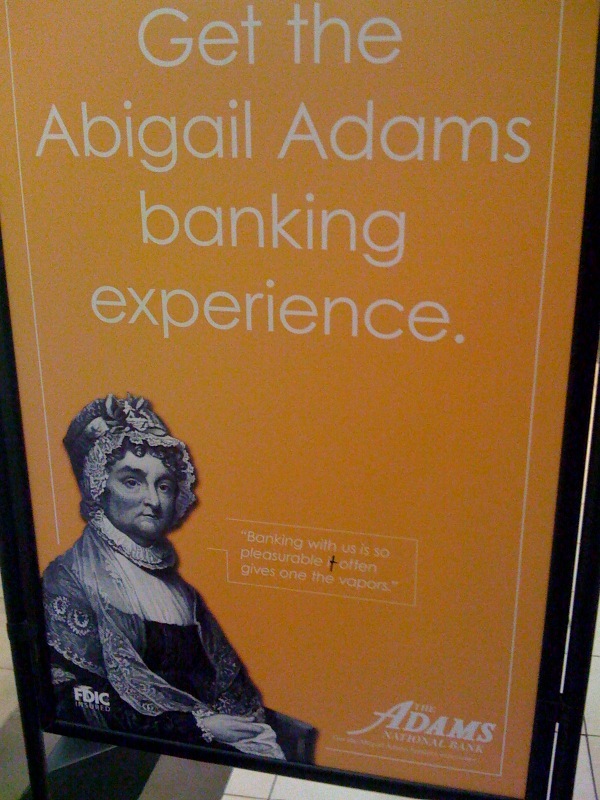 Using Adams bank gives Abigail Adams the vapors? And that’s supposed to be a good thing? Having the vapors was a medical term used roughly around the time of the Civil War, which was fifty years after Abby Adams was dead. It was used to refer to nervous disorders like depression or hysteria. There’s a misconception that it was also used to refer to flatulence, though I cannot find hard evidence of that. Either way an ATM that gives me gas with a bought of depression seems like a place I want to bank. I wonder if the bank gives away a combination of Gas-X and Zoloft with every checking account? Someone paid for this ad? I think Creative got a little too creative. Posted on August 6, 2008 August 6, 2008 Author Ian GlazerCategories Random Thoughts1 Comment on Someone paid for this ad campaign?